May 31, 2018 – In its regular emailed newsletter, the book distribution giant Ingram reports that the publishing industry is alive and well, the focus of the attention of several investors with deep pockets. I was blessed with a copy of the Ingram email because I stopped by their Javits Center booth this morning at BookExpo. Ingram offers a great deal to self-publishers, including hard-cover options in a variety of sizes. In support of the thesis that book publishing has a great future, Ingram cites an article from earlier in the month in the Wall Street Journal that names Snap Inc. Chairman, Michael Lynton, billionaire Len Blavatnik, and Ellis Jones, chairman of investment firm Wasserstein & Co., among investors pouring millions of dollars into printed books. The immediate focus of the WSJ article was the acquisition by Lynton and the investors of the regional publishing company Arcadia, which engages nostalgia buffs by producing collections of high-quality old photographs in heritage books. 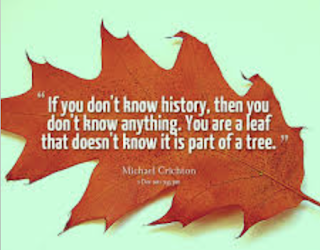 Arcadia is the largest local-history publishing company in the United States, with 14,000 titles. Last month, Sen. Kirsten Gillibrand introduced S. 2755, the Postal Banking Act. The bill would establish retail banking services at every U.S. post office and authorize the U.S. Postal Service (USPS) to offer checking and savings accounts, small-dollar loans, debit cards, cash withdrawals and money transfer services in each of its roughly 30,000 offices. – Dana Chasin's Update 275, Guest-Posted by Permission. In 1910, President William Howard Taft introduced a postal-savings system for new immigrants and the poor that lasted until 1967. The need for postal banking has been revived by several recent events. The USPS Inspector General (IG) published a report in 2014 in response to the USPS $2.7 billion deficit, describing how the USPS could implement postal banking policies to address the agency's funding crisis. Postal banking could generate $9 billion profit. Sen. Elizabeth Warren has been a long time advocate of postal banking since this IG report and lauded many of the benefits of postal banking. Sen. Bernie Sanders brought postal banking back to the forefront with Sen. Warren during the 2016 primary campaign. The endorsements by these progressive stars in the Senate led to strong popular support of the idea, but neither Senator introduced legislation. S. 2755 is the first legislative step since 2014. Because of a lack of access to high-quality financial institutions, many Americans take out high interest, high-cost alternative forms of credit, costing them nearly $100 billion a year. The average underserved household pays creditors 10 percent ($2,412) of their gross income in fees and interest. Postal banking would allow more than 80 million lower-income Americans without bank accounts to access essential financial tools and be safeguarded from predatory lenders. The USPS’s 30,000 office locations would house the retail arm of the bank because they are located in every community. These locations exist in banking deserts. 38 percent are in zip codes with zero banks and 21 percent are in zip codes with only one bank branch. Providing access will help Americans generate savings, wealth and credit, while bringing millions of households into the banking system. President Trump recently gave a speech blaming Amazon for the USPS funding crisis. Nevertheless, Congress is the entity most responsible for the funding crisis facing the USPS. This funding crisis has plagued the USPS since the Bush administration passed the Postal Accountability and Enhancement Act of 2006 (PAEA). The USPS has reported losses every year since 2007, losing $2.7 billion in 2017 alone. This can be attributed to the provision in PAEA that requires the Postal Service to prefund its retirees' health benefits up to 2056. Costing $5 billion per year, this is a requirement that no other entity, private or public, has to make. According to the 2014 IG’s report, postal banking would generate $9 billion in profit annually, effectively eliminating the funding crisis the USPS faces. The main focus of S. 2755 is to fight payday lending. S. 2755 would implement smaller short term loans as a public option. 12 million people spend a total of $7 billion a year on short term, smaller loans known as payday loans. These loans average $375 initially with an additional $520 (138%) in fees and interest. Payday lenders have been known to charge interest rates in excess of 300 percent. The USPS has estimated that they could provide the same loan for less than 30 percent in interest rates. S. 2755 would set the interest rates around 10 percent. Payday lending may be a trickier legislative fix than the first two benefits provided by the bill. There would be underwriting issues that would have to be solved and the interest rate would have to be debated. Implementing small dollar loans into postal banking, however, would decrease predatory payday lending and increase the number of low income Americans who have access to loans they can pay back, improving credit scores. S. 2755 would assist millions outside of the banking system who are vulnerable to predatory lenders and other risks, especially those living in rural areas. Many of these people have been denied access to financial institutions simply because of their location. Although access to financial institutions has not been regarded as a fundamental right in the past, this bill attempts to frame it that way and poses the question: Why haven’t we regarded it that way before? And why isn’t access to financial institutions a fundamental right? It should come as no surprise there are opponents to incorporating financial services into USPS operations. The Citizens Against Government Waste has been vocal, publishing a letter arguing the Postal Service should not be trusted to manage money, pointing to it surpassing its statutory debt limit and $120 billion unfunded liability. Anti-government conservatives in the Republican Party are unlikely to warm up to an idea like S. 2755 anytime soon. The bill is something to watch if the Democrats continue to regain power as the midterm elections proceed.. The Congressman from CD 1 in Suffolk County, New York, was first elected in 2014, and reelected in 2016. He has made creating jobs a central part of his program, one of the main issues highlighted on his own web site. He said in 2016 he would go to Washington, work with the Tea Party to reduce environmental and other regulations, and "help grow our economy and create more good paying jobs". So how's it going with that, Mr. Zeldin? Numbers just came out today for the fourth quarter of 2017. 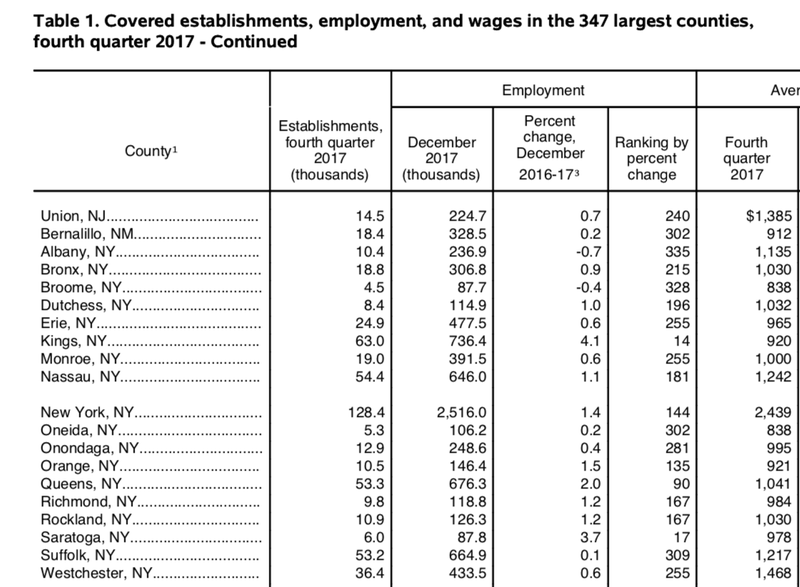 They show that Suffolk County ranked 309th out of the 347 largest counties for growth during 2017, comparing fourth quarter 2017 with the fourth quarter of the previous year. The growth rate was Point One Percent. That's one-tenth of one percent. That is statistically equivalent to Zero. Compare that with Brooklyn (King's County), which grew 41 times as fast, 4.1 percent, and ranked 14th out of the 347 largest counties. Zeldin has had two terms to prove he can make a difference in job growth. I would say he flunks his own test. He has not helped grow the economy. He has not "created more good-paying jobs". Time's up! Two months ago, teachers in West Virginia began a statewide strike that would last for weeks. It would pay off, winning gains for educators who have endured some of the lowest wages and worst benefits in the country. Yet the stuck wages afflicting so many workers stand alongside a 45-year low in new unemployment claims last week. What explains this disparity? What in fact are the prevailing labor and wage conditions in the country? What are the political implications for November? The following comments are from an email from Dana Chasin, posted here by permission. Inspired by the efforts in West Virginia, teachers across the country’s low-wage states have initiated job action. Tens of thousands of teachers have walked out across Oklahoma, Arizona, Kentucky, and Colorado to protest low wages, poor benefits, and shrinking education funding. Tensions are simmering in North Carolina and Mississippi, and calls for action in Texas and Indiana suggest that the wave of teacher strikes is likely far from over. Americans overwhelmingly support teachers’ demands for higher wages. Over 50 percent of the country would support higher taxes to raise teachers’ wages. Perhaps this support is attributable to familiarity. If the grievances that these educators cite to justify labor action sound familiar, that’s because stagnant wages and declining benefits have come to define the American labor market conditions in recent years. As with red-state teachers, a vast majority of Americans rely on their paychecks and employer-provided benefits to make ends meet, and these have hardly improved in decades. Between 1950 and 1970, Americans enjoyed a post-war boom that saw wages grow in line with the broader economy. Economists have long thought that if worker productivity rises, wages will also increase in kind. The three decades after WWII supported this notion. Over this period, wages rose by 91 percent, almost exactly in step with the 97 percent rate growth in national productivity. 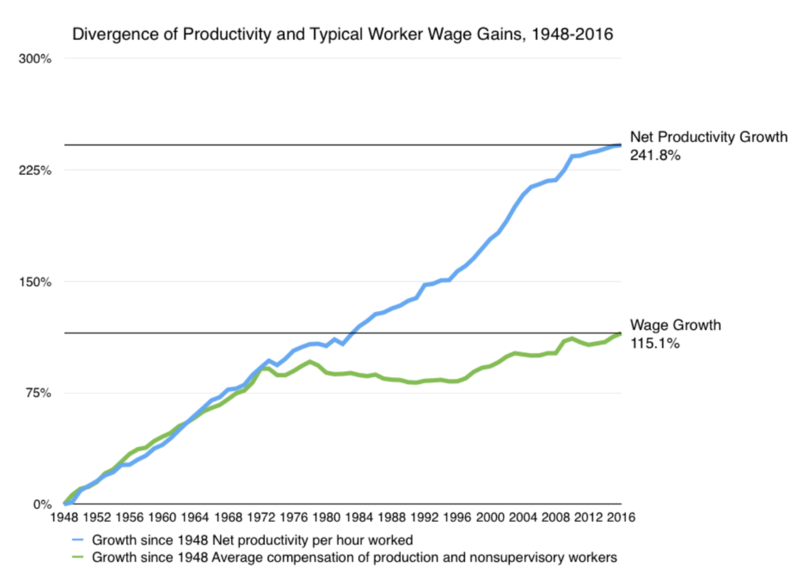 In 2016, American workers were 75 percent more productive than they were in 1973, but had only seen their take home pay rise 12 percent in that time. American workers have seen their share of productivity gains collapse. President Trump and congressional Republicans say that the stable and historically low unemployment rate is their doing, not that they inherited an economy that saw steady reductions in unemployment for five straight years. Real wages have been stagnant for even longer, but Trump is not taking credit here. In many cases even the declines seen in unemployment rates are concentrated predominantly in low-wage, low-quality job sectors. While the economy has been adding jobs, in many places around the country these jobs tend to pay the minimum wage. Regional differentials in labor markets can also confuse national-level statistics. Beyond this, while today’s unemployment rate is certainly low, this can obscure real problems in the labor market. During the Great Recession, the labor force participation rate fell from 67 percent to 63 percent. Many people fell into underemployment or lost faith in the notion that any opportunities existed for them. The size of the workforce has remained around 63 percent since, suggesting fewer opportunities and a lingering disillusionment among those that have fallen out of the workforce. The Bureau of Labor Statistics (BLS) quantifies an alternative measure of slack in the labor market that takes the above categories of workers into account. While the unemployment rate (measuring only those seeking jobs within the last four weeks as being unemployed) is 4.1 percent, another measure reveals a more substantial underutilization of the workforce. When taking into account the workers who are involuntarily part-time, marginally attached workers, and discouraged workers, the U-6 unemployment rate is 8.3 percent today – more than twice that of the conventional measure. There is considerable debate as to why incomes have stagnated for as long as they have. Some theorists see “market-exogenous” changes in technology and globalization to explain the rise of inequality. In this formulation, advances in shipping and information technologies allowed capital unfettered access to the entire world’s labor supply, causing a shift in production from high wage areas to low wage areas. More recently, economists and policy thinkers have turned their attention to the role of market power or labor market concentration in wage analysis. This theory focuses on concentration as a driving factor in wage stagnation. Market concentration accounts for 10-15 percent of annual wage losses, suggesting that workers’ wage bargaining power is weakening in certain robust labor markets. public infrastructure degradation and a dearth of mass transportation options. The concentration of labor markets and the collapse of worker power have played an important part in the divergence between labor productivity and wage growth, and can at least partially explain the why wages are hardly responding to very low unemployment rates. America is comprised of very diverse economies across many regions. While technological changes and shifting market power have depressed employment levels and wages overall, the composition of local economies determine the effect those developments have on a local workforce. Regional economies with significant vulnerability to trade competition have seen commensurate declines in employment. Those exposed to technological change have undergone a reorganization of the local workforce. Those that have experienced market consolidation have seen other deleterious effects. President Trump and Congressional Republicans may try to take credit in the run-up to the November midterm elections for the nation’s continued low unemployment rate. But their claims will likely fall on deaf ears in communities where trade competition have depressed employment and where laborers have lost negotiation power relative to their employers. After cutting taxes overwhelmingly for the corporations and the wealthiest, the GOP hasn’t shown many voters yet the benefits they were promised; instead, they continue to struggle with continually stagnant wages and precious few good jobs. But with all the GOP tax talk, they increasingly perceive another threat to their retirement security, which we will address next time. To be added to the news digest assembled by Dana Chasin and the 20/20 team, go here.